The five employees at SheFinds Media write, manage and promote all of the content on SheFinds.com and MomFinds.com, which keeps us pretty busy - so we outsource a lot of the tech work to other firms. We recently re-launched our flagship site, SheFinds.com, and the process was bumpy to say the least. All three parties working on the re-launch - the SheFinds staffers, our SEO firm, and our design and development agency - were finding random bugs, broken links, and failed redirects on the new site. After a few days of incessant back-and-forth e-mails about fixing one-off issues, our inboxes were stuffed and the whole team was confused about who was assigned what responsibilities. Switching the process over to Google Docs streamlined the whole thing. 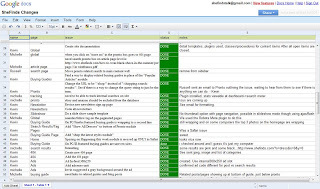 We listed all the bugs and errant links in a spreadsheet, color-coded the status of each issue, and added comment columns so everyone could see the nitty gritty of each problem without doing a dozen inbox searches. Our Google Doc also made managing the whole process a lot less stressful, since I knew all the items were accounted for and nothing would be overlooked. We're re-launching MomFinds.com in a few weeks, and I can say right now, there will be a Google Doc up and waiting when the site goes live - I anticipate some of the same re-direct and broken link issues, and I'm glad to be prepared to solve them in an organized way from the outset. The tool makes coordinating information from three different companies in three different locations logistically simple - we're happy to have discovered it the first time around.